It gives me great pleasure to share with you another milestone achieved by the Cochlear Implant Service at Apollo Hospital, New Delhi. Having carried out over 300 cochlear implant procedures in the last 4 years alone, we have now successfully performed our first Paediatric Auditory Brainstem Implantation (ABI). This four year old child has severe (Grade I) cochlear hypoplasia with auditory nerve hypoplasia. Further, it is a matter of great pride and confidence for us that this ABI surgery was performed completely and successfully by our local team, independent of any overseas surgeon assistance. 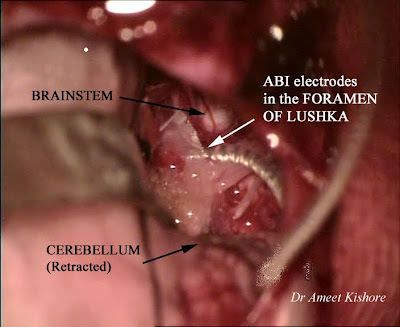 (Dr Ameet Kishore - ENT & Neuro-otology ; Dr Pranav Kumar - Neurosurgery and Ms Neevita Narayan, Audiologist, SpHear Clinic, who carried out the intraoperative EABR recordings). A truly Indian achievement !